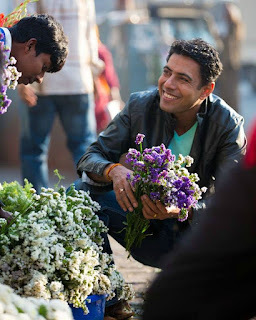 Being Indian, it is inevitable for our festivals to be associated with flowers and mithais. As tradition and for the aesthetics, flowers are unmatchable; somewhere though there always have been floral aspescts in our food as well. The good news is that the floral connect to food is coming back. These days' flowers are used a lot in food for garnishing and flavours, becoming super trendy in the last five years or so. The most common flowers used for garnishes are nasturtium, marigold and clovers. My travels astonish me with the amazing ways that people find of adding flowers to their diet. Chef Andy Husbands of Boston once fed me a dandelion salad with Jicama, served with a glass of dandelion wine. The salad was just crisp, awesome dandelion leaves tossed with dried dandelion flower vinaigrette and the wine was made purely out of fermented dandelion flowers. Ayurveda has also endorsed dandelion (simha danti) as its leaves and root are essential part of all kidney and liver medicines. Hibiscus is another flower that won my heart in my travel to the west. In Hawaii, I tasted the most amazing jam made out of wild hibiscus flowers (Rosella). Hibiscus also goes well with light teas much like Chamomile, another flower that is amazingly flavoursome and addictive. Then there is our Rose, the King of flowers and the body balancer of Ayurveda. Recorded rose recipes date back to the 9th century. 1. For the sweet paste, cream butter and icing sugar together. Add eggs gradually to this. Lastly, fold in flour and make a flat dough. Keep in the fridge for two hours to rest. 2. For Kalakand filling, cream together butter, kalakand and caster sugar till light and fluffy. Sift flour and almond powder together. Add eggs gradually into the butter mixture. Fold flour and almond powder in. Add rose water and mix well. 3. For rose cream and coconut snow, lightly whip the cream, add rose water and 10 ml rose syrup. Rub the coconut with the remaining rose syrup for the snow. 4. Roll the sweet paste dough into a thin sheet. Line the tart mould with it. Fill the lined tart mould with rose almond cream to more than half. 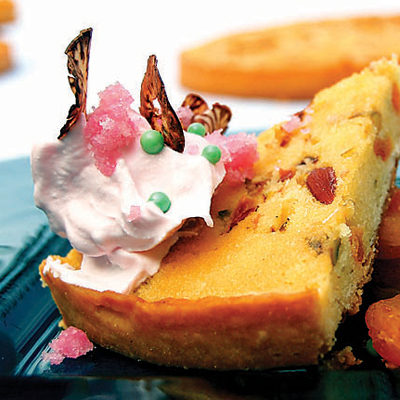 Sprinkle sliced mix nuts and dried rose petals on top and bake at 170c for 25 to 30 minutes. Keep it aside to cool.